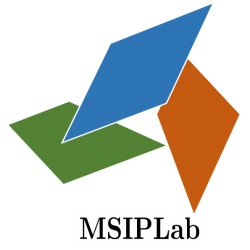 Image Transforms – MSIP Lab, Niigata Univ. Chen Zhiyu and Shogo Muramatsu, Multi-focus Image Fusion based on Multiple Directional LOTs, IEICE Trans. on Fundamentals, vol.E98-A, no.11, pp.2360-2365, Nov. 2015. Chen Zhiyu and Shogo Muramatsu, SURE-LET Poisson Denoising with Multiple Directional LOTs, IEICE Trans. on Fundamentals, vol.E98-A, no.8, pp. 1820-1828, Aug. 2015. Natsuki Aizawa, Shogo Muramatsu and Masahiro Yukawa, Image Restoration with Multiple DirLOTs, IEICE Trans. on Fundamentals, Vol.E96-A,No.10,pp.1954-1961,DOI: 10.1587/transfun.E96.A.1954, Oct. 2013. Shogo Muramatsu, Dandan Han, Tomoya Kobayashi and Hisakazu Kikuchi: Directional Lapped Orthogonal Transform: Theory and Design, IEEE Trans. on Image Processing, Vol.21, No.5, pp.2434-2448, DOI: 10.1109/TIP.2011.2182055, May 2012. Shogo Muramatsu, Tomoya Kobayashi, Minoru Hiki and Hisakazu Kikuchi: Boundary Operation of 2-D Non-separable Linear-phase Paraunitary Filter Banks, IEEE Trans. on Image Processing, Vol.21, No.4, pp.2314-2318, DOI: 10.1109/TIP.2011.2181527, April 2012. Shogo Muramatsu, Akihiko Yamada and Hitoshi Kiya, A Design Method of Multidimensional Linear-phase Paraunitary Filter Banks with a Lattice Structure, IEEE Transactions on Signal Processing, vol. 47, no. 3, pp. 690-700, DOI: 10.1109/78.747776, Mar. 1999. Zhiyu Chen and Shogo Muramatsu, Poisson denoising with multiple Directional LOTs, Proc. of 2014 IEEE International Conference on Acoustics, Speech and Signal Processing (ICASSP), pp.1234-1238, May 2014. Natsuki Aizawa and Shogo Muramatsu, FISTA-Based Image Restoration with Multiple DirLOTs, Proc. of IWAIT 2013, Jan. 2013. Shogo Muramatsu, Natsuki Aizawa and Masahiro Yukawa, Image Restoration with Union of Directional Orthonormal DWTs, Proc. of APSIPA ASC 2012, Dec. 2012. Shogo Muramatsu: SURE-LET Image Denoising with Multiple Directional LOTs, Proc. of 2012 Picture Coding Symposium (PCS2012), May 2012. 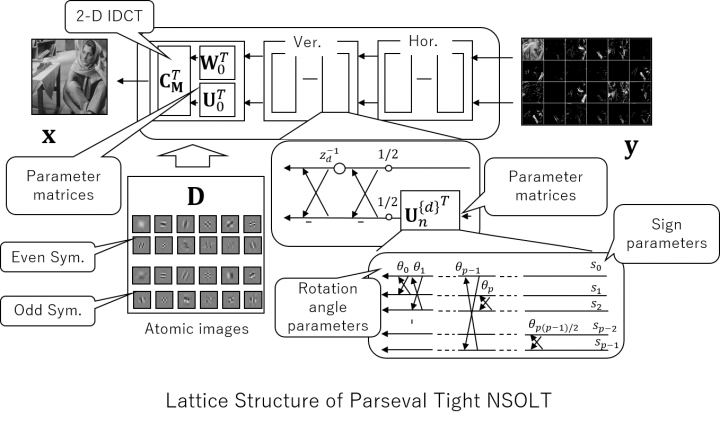 Shogo Muramatsu and Dandan Han: Image Denoising with Union of Directional Orthonormal DWTs, IEEE Proc. of 2012 IEEE International Conference on Acoustics, Speech and Signal Processing (ICASSP), pp.1089-1092, Mar. 2012. Shogo Muramatsu, Dandan Han and Hisakazu Kikuchi, ”SURE-LET Image Denoising with Directional LOTs, Proc. of APSIPA ASC 2011, Thu-PM.PS1.9, Xi’an, China, Oct. 18 – 21, 2011. Shogo Muramatsu, Dandan Han, Tomoya Kobayashi and Hisakazu Kikuchi, Theoretical Analysis of Trend Vanishing Moments for Directional Orthogonal Transforms, Proc. of PCS2010, pp.130-133, Nagoya, Japan, Dec. 7-9, 2010. Tomoya Kobayashi, Shogo Muramatsu and Hisakazu Kikuchi, 2-D Nonseparable GenLOT with Trend Vanishing Moments, IEEE Proc. of International Conf. on Image Proc. (ICIP2010), Hong Kong, pp.385-388, Sep. 2010. Tomoya Kobayashi, Shogo Muramatsu, Hisakazu Kikuchi, Two-Degree Vanishing Moments on 2-D Non-separable GenLOT, IEEE Proc. 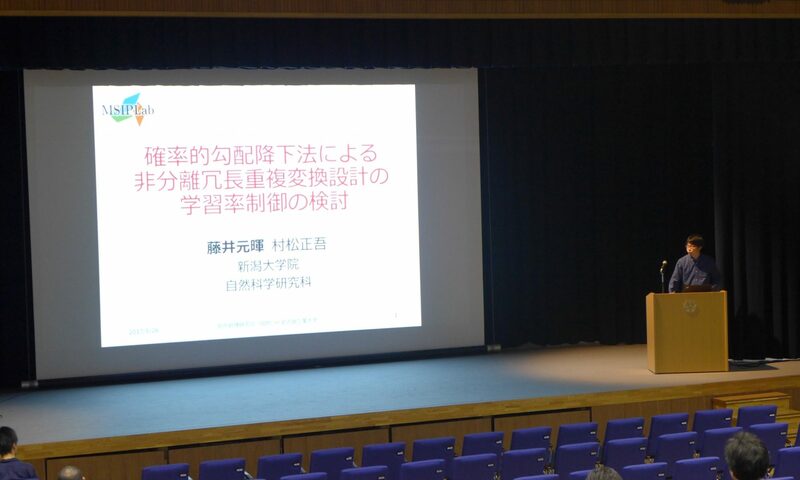 of 2009 International Symposium on Intelligent Signal Processing and Communication Systems (ISPACS2009), pp.248-251, Kanazawa, Japan, Dec. 7-9, 2009. Shogo Muramatsu and Minoru Hiki, Block-Wise Implementation of Directional GenLOT‘, IEEE Proc. of International Conference on Image Processing (ICIP2009), pp.3977-3980, Cairo, Egypt, Nov. 7-11 2009. Shogo Muramatsu, Kosuke Furuya and Naotaka Yuki, Multidimensional Nonseparable Oversampled Lapped Transforms: Theory and Design，IEEE Trans. on Signal Process.，Vol. 65, No. 5, pp.1251 -1264, DOI: 10.1109/TSP.2016.2633240, Mar. 2017. Kosuke Furuya, Shintaro Hara, Kenta Seino and Shogo Muramatsu, Boundary Operation of 2-D Non-separable Oversampled Lapped transforms, APSIPA Transactions on Signal and Information Processing, Vol. 5, pp.1-9, DOI:10.1017/ATSIP.2016.3, April 2016. Shogo Muramatsu, Masaki Ishii and Zhiyu Chen, Efficient Parameter Optimization for Example-Based Design of Non-separable Oversampled Lapped Transform, Proc. of 2016 IEEE Intl. Conf. on Image Processing (ICIP), Sept. 2016. These works are supported by JSPS KAKENHI JP23560443, JP26420347.